The Compulsive Reader: Win Numbers by Rachel Ward! Numbers by Rachel Ward is a fast-paced and thrilling read that just came out recently, and I have three copies to give away here! Ever since she was child, Jem has kept a secret: Whenever she meets someone new, no matter who, as soon as she looks into their eyes, a number pops into her head. That number is a date: the date they will die. Burdened with such awful awareness, Jem avoids relationships. Until she meets Spider, another outsider, and takes a chance. The two plan a trip to the city. But while waiting to ride the Eye ferris wheel, Jem is terrified to see that all the other tourists in line flash the same number. Today's number. Today's date. Terrorists are going to attack London. Jem’s world is about to explode! Click here to visit the book's website. Now, all you have to do to enter is comment below! This contest is for US residents only, but if you have a friend to receive your prize, international readers are welcome to enter as well. You have until March 22nd, 2010! Good luck! I'm interested in reading Numbers! Count me in; I'd love to be entered in the contest. Thank you! Hi! I really enjoy your review and I am eager to read the book, plaese count me in! i saw this book in a book store and was very intrigued by the concept. Not only does it sound good but that trailer really makes me want to read it as well. Count me in please. Please enter me. This book looks good. i would love to read this book. It sounds really great. Lots of giveaways for this book. :) Hoping to snag a win cause it sounds pretty cool! Numbers sounds SO good! I'd love to be entered into the contest. Love the book trailer too! Oooohhh! This looks so good! I would love to enter! Looks interesting. Please enter me in the contest. Sounds like a fantastic book. Thanks for the contest. I think this sounds so good. I couldn't imagine having a "gift" like that. I would love to win a copy, please enter me. I would love to be included. It sounds like a interesting story. Not so ordinary = great read, count me in! Numbers looks so good! Thanks for the great contest. Do you know how I long it took me to realize that there is an eye on the cover. and then when I saw it I couldn't believe I hadn't seen it before! Thanks for the contest. Count me in! The book sounds fascinating. I've been looking forward to reading this one! This book sounds like one I would really enjoy reading. And I heard the ending was great. Hey! it would be awesome to win a book especially Numbers love the idea of it! So...Pick me pick me! Please enter me! Numbers sounds fascinating. OMG YES PLEASE. Sounds amazing! Thanks for the contest. I'm really looking forward to this book! Numbers looks so good! I would love to be entered! Sounds like a intriguing book! I tried to get it at my local Borders AND Barnes & Noble but they are all sold out *sniff* TEHE but anyways I'd love to enter! This looks so good! I can't wait to read it. Awesome! I'd love to read this! Great contest, this book sounds really good. I love the unique story premise! I would love to read this book, please count me in! The teaser for this book just gave me chills and I bumped it up to the top of my long list of to-be-read books! Can't wait till it comes out! Wow ! This book sounds AMAZING ! Please enter me ! Thank you very much ! I really want to read this books! I'll be so happy if I do. Enter me!Thanks a bunch. I really want this book!!! It sounds fantastic. I would like to be entered. Please count me in! This book sounds great! 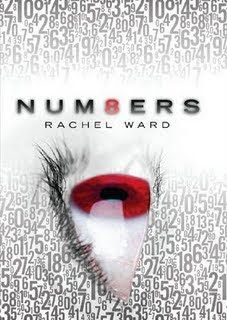 Please enter me in the contest, would love to read Num8ers! I would like a chance, thank you! I'd love to win this contest!! !